Donizetti’s fascination with the story of Gabriella di Vergy began in 1826. The grisly appeal of the story of Gabriella lies in its powerful final scene in which Gabriella’s husband, Fayel, delivers to her a casket containing the still-warm heart of her lover, Raoul. 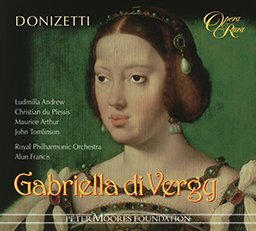 Donizetti’s fascination with the story of Gabriella di Vergy began in 1826. His first version, written for his own pleasure, was never completed. For over a century that was all that was known to exist. In 1979, Opera Rara discovered in a London library a hitherto unknown complete opera on the same subject. Donizetti had written this for Naples in 1838. The grisly appeal of the story of Gabriella lies in its powerful final scene in which Gabriella’s husband, Fayel, delivers to her a casket containing the still-warm heart of her lover, Raoul. 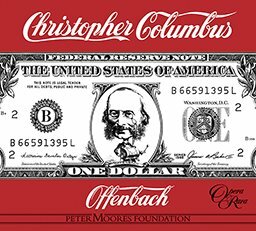 On this world premier recording, Opera Rara also includes three pieces from the 1826 version. 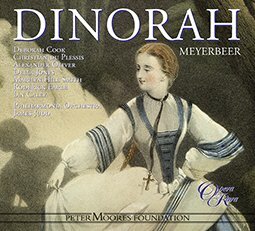 Ludmilla Andrew, Christian de Plessis, Maurice Arthur, John Tomlinson, Joan Davies, John Winfield, Geoffrey Mitchell Choir, Conductor Alun Francis. (Scenes from Gabriella di Vergy 1826 version – Eiddwen Harrhy and Della Jones).